This badge was issued to Paisarn Rojanaphusit on 05 Jun 2017. 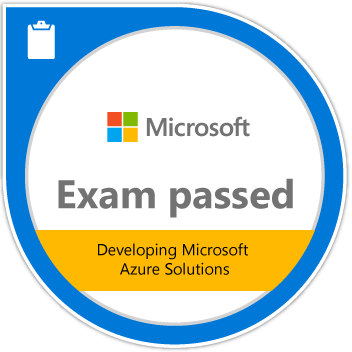 This exam is for candidates who are experienced in designing, programming, implementing, automating, and monitoring Microsoft Azure solutions. Passing this exam validates a candidate’s ability to create and manage Azure Resource Manager Virtual Machines, design and implement storage and data strategy, manage identity, application, and network services, and design and implement Azure PaaS compute and web and mobile services.